Do you want to listen to your favorite tunes without being fully immersed so that you know what’s going on around you? 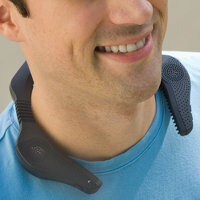 The Stereo Neckphones will come in handy, although jogging around with it isn’t that advisable as you might end up with a sore neck after a lengthy and uncomfortable run. This is the slender, lightweight dual-speaker system that rests around your neck and allows you to listen to music while you remain aware of your surroundings. It plugs into any portable audio device with a standard 3.5mm plug (compatible with iPhone and iPod Touch) with its 36″ cord. Its dual 1″ speakers offer a frequency range of 20Hz-20,000Hz for high-quality sound and are positioned to project sound up to your ears. With built-in volume control. The system only weighs 7 1/2 oz. and has two flexible sections on either side of the frame that enable you to adjust them for optimal comfort. Powered by a couple of AA batteries that are able to keep on going anywhere from 15 to 30 hours of non-stop audio playback (that’s a pretty huge range, making me wonder how they tested its battery life), the Stereo Neckphones is going for $129.95.